Fruit in general isn’t known for its protein content, but there are some that are better than others when it comes to helping you round out your protein intake for the day. In addition to being high in vitamins and antioxidants, fruit also provides a delicious alternative to refined sugar when your sweet tooth hits. 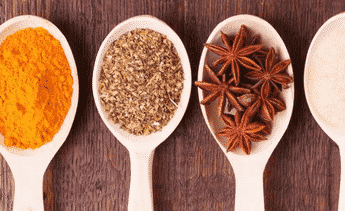 Many of these vitamins act as powerful antioxidants in the body, strengthening your immune system and helping to battle back the free radicals that are produced each day. 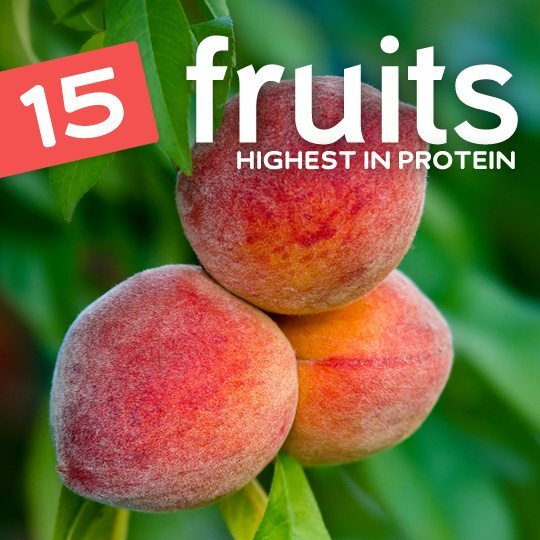 Here are the top fruits highest in protein, ranked in order from highest to lowest. Guava may not be in your regular fruit lineup, but there are plenty of reasons to give it a regular role in your diet. Of course, to take the number one spot on our list, guava needs to provide substantially more protein than other fruits, and it does, but it has plenty of other qualities that can’t be ignored. For example, guava contains 8.9 grams of fiber per serving as well as a whopping 419 percent of your daily recommended value of vitamin C, which is far more than oranges. 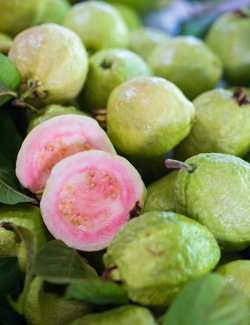 Guava also contains a good amount of potassium magnesium, vitamin A, B vitamins, and iron, as well as vitamin E and lycopene. That’s not too shabby for a fruit. Tips for eating more: If you’re not familiar with guava, they’re easy enough to prepare. You simply wash it off, cut it in half, and slice it up. From there you can eat it directly or add it to a fruit salad. You may be surprised to find avocados on a list of protein-filled fruits, but it outdoes many of its fruit relatives in the protein department, even though it gets most of the attention for its healthy fats. Avocados used to be considered something you should avoid eating too much of because of their fat content. These days we know that not all fats are the same, and the kind of fat avocado contains are the kind that you should be getting, both to help lose fat and also as part of a complete and healthy diet. 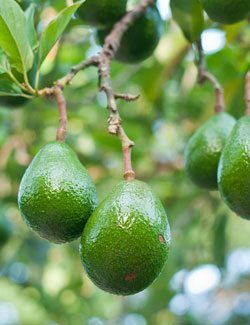 Avocados have plenty of benefits in addition to their protein, and most of the time their potassium and healthy fat content is what gets the focus. You simply can’t go wrong by adding more avocado to your diet, especially in the summer and winter months. Tips for eating more: Avocado goes great on top of a salad, mashed up into guacamole, or eaten all by itself as a between meal snack. Add them to a smoothie for an even smoother texture, added protein, and healthy fats that keep you feeling full for a long time. 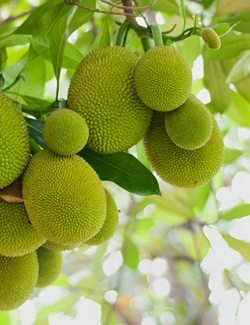 You may have to search around to find jackfruit, or go to a fruit market, but it’s worth the hunt. Jackfruit is not only a good source of fruit protein but it’s also high in vitamin C and fiber, like many other fruits on our list. One feature of jackfruit that you won’t want to overlook is its potassium content. Much like a banana a serving of jackfruit will boost your potassium and help you reach your daily requirement. One thing that most fruits have in common is their antioxidant content. Jackfruit is no exception, and it contains vitamin C as well as a bit of vitamin A to help the body fight off free radical damage. Tips for eating more: Preparing jackfruit can be a chore due to its large size and outer covering, but it’s worth the effort at least occasionally to add some variety to your diet and get the benefits it provides, as well as to enjoy it’s sweet flavor. Apricots contain more protein then you’d think, but they have to be the dried variety, as fresh apricots don’t yield the same amount of protein. You’ll find that with most dried fruit their values are concentrated, but so is the sugar content. Even better than the protein they provide, apricots are also an excellent source of vitamins A and C, which both act as an antioxidant within the body to help protect it from free radical damage, especially damage done to the eyes. 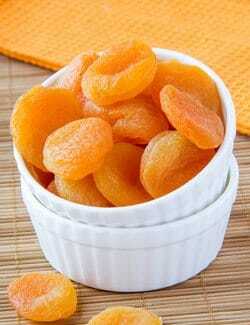 Apricots also contain a fair amount of potassium, which helps maintain healthy blood pressure numbers. The benefit of eating fruit to supplement your protein requirements is that you’ll almost always be getting extra benefits from antioxidants and minerals, as well as fiber. Tips for eating more: Chop up dried apricots and put them on your cereal or bake them into a high-protein cookie. Research shows that the average kiwifruit contains 2.1 grams of protein per cup, which isn’t hard to eat since this is one delicious fruit. 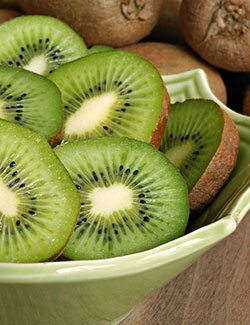 It also contains 185 percent of your daily recommended intake of vitamin C, 60 percent of your daily recommended value of vitamin K, and 18 percent of your daily recommended intake of vitamin E. Coupled with 5.4 grams of fiber, kiwifruit is one tasty treat you don’t want to miss out on! Tips for eating more: We recommend eating these babies raw or with a handful of nuts. If you’re not familiar with them, you’ll need to peel back the brown skin to get to the good stuff. Berries are among the healthiest foods you can eat. A one-cup serving of blackberries contains two grams of protein, which might not seem like alot, but a little bit adds up.They also contain 7.6 grams of fiber to help keep you regular and plenty of vitamins, minerals, and antioxidants, such as vitamin C, anthocyanins, iron, calcium, magnesium, vitamin A, potassium, vitamin E, vitamin K, and folate. Tips for eating more: Enjoy a handful of raw blackberries along with some raw nuts as a snack, or put them in your morning bowl of oats in place of blueberries for a berry switch up. 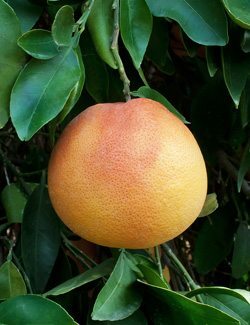 Grapefruit has earned the reputation as being a healthy food, and it provides a modest amount of protein compared to other fruit on our list. Overall, you’ll be getting plenty of benefits by eating grapefruit, many of which overshadow anything you’d get from its protein content. Grapefruit can help with weight loss efforts, and you don’t need to use it as part of any Grapefruit Diet or extreme weight loss plan. A daily grapefruit in the morning provides you with a good start on your fiber, while being a low-calorie food and providing you energy to get you through your morning. In addition to its weight loss benefits and protein, grapefruit is also a good source of vitamin C, like most citrus fruit. This will strengthen your immune system, making grapefruit a great fruit to have through the winter, when the flu and other viruses are being passed around. Tips for eating more: If you’re put off by the sour taste of grapefruit but don’t want to add refined sugar to it, try half a teaspoon of raw, organic honey spread along the top of half a grapefruit. Because of the bright red color of red currants, you can add a splash of color to your plate while at the same time adding protein, fiber, and important minerals to your diet. Currants are loaded with fiber, and will help you meet your fiber needs. It’s important to consider fiber along with protein because many high-protein foods contain little to no fiber. Eating a food like currants that is a source of protein as well as fiber is a great way to supplement your protein intake and help your digestive system function. 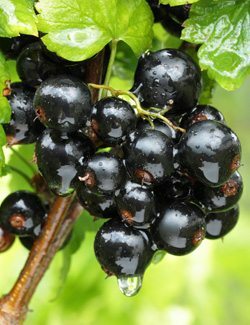 Currants also provide you with a big chunk of your vitamin C requirement, and are on par with the kind of vitamin C you get from an orange. Tips for eating more: Because of their size and berry shape you can pop them on top of a salad, or simply pop them in your mouth. They can also be turned into a jam and used in much the same way you’d use a jam made from other berries. 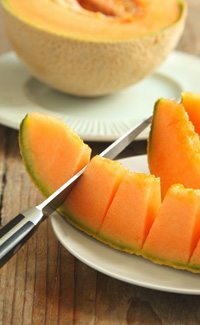 One of the tastier ways to increase your protein is to have some cantaloupe. Its sweet flavor and soft texture make it a delicious addition to your day, and it has plenty more going for it. Cantaloupe is high in vitamin A and vitamin C, a duo that really helps out your immune system with two powerful antioxidants that will go to work protecting you from free radical damage. Because of its orange color, cantaloupe is a source of beta-carotene, an antioxidant that helps your eyesight as well as your immune system. It also contains some fiber, to help with your digestive system. Peaches signal summertime and you can add to your protein intake by having a peach. Much like the other entries on our list, peaches bring a lot more to the table than just a bit of protein. Peaches are a source of beta-carotene, which helps with your eyesight as well as your immune system. You can spot beta-carotene foods via their orange coloration. Think carrots, sweet potatoes, cantaloupe, and others with an orange hue. They are also a good source of fiber, which helps to keep your digestive organs clean and toxin-free. For this re,ason you’ll often see them included in diet and weight loss programs for the natural weight loss effect they provide. 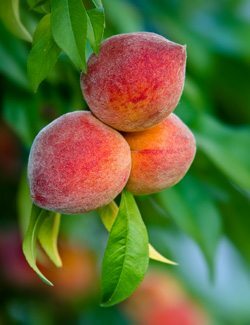 Tips for eating more: It can be hard keeping fresh peaches and eating them before they go bad, so buy a bag of organic frozen peach slices and add them to smoothies or a bowl of yogurt for even more protein. 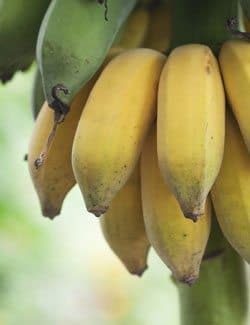 Bananas contain enough protein to make our list of high protein fruits, but keep in mind that they’ll only add a fraction of your total recommended daily value of protein. It’s the other features of bananas that make them a smart choice as part of a protein-conscious diet. They are well-known for their potassium, which provides you a full 9% of what you need each day. Besides potassium and protein, bananas will also help you top up your fiber for the day. Enjoying a daily banana can help you maintain a healthy weight, can keep your digestive system moving, and because of the potassium they contain can help keep your blood pressure numbers in line. Tips for eating more: Bananas are the ultimate go anywhere snack, and they come with their own portable packaging. 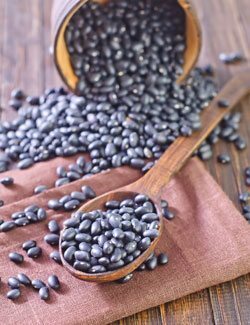 They also taste great on a bowl of oatmeal or cereal, or can be added to a smoothie to smooth it out as well as increase its protein. Raspberries may not be bursting with protein, but they will help contribute to your total grams of protein taken for the day, and round you out with an array of vitamins, minerals, and fiber, making them more than worth your while. Raspberries and other berries made our list of superfoods thanks to the antioxidant value they have, which is important when you’re trying to undo some of the damage by free radicals. 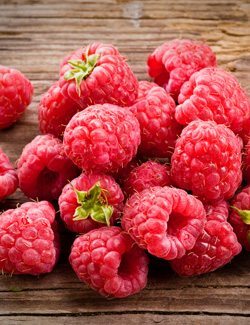 You wouldn’t want to rely on raspberries alone to meet your antioxidant needs, but when combined with other healthy foods they will tip the scales in your favor. In addition to their protein and antioxidant content, raspberries are also a respectable source of fiber, so you’re getting at least three great benefits from eating them. Tips for eating more: Raspberries go really well with yogurt, and it makes a great way to start your day off right in the protein department because yogurt is also a good source of protein. The tartness of both raspberries and yogurt make them a complementary pair. 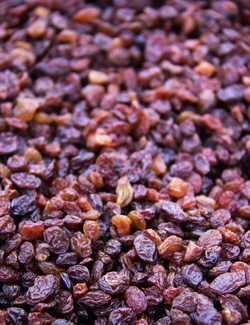 Raisins are easy to eat a lot of, so you’ll pack in more protein by the ounce. Their chewy sweetness is often used in baking and with snacks to provide nutrition, including added protein. Raisins will help out your digestion, and they’re an often overlooked source of calcium, so you’re getting support for your bones when you eat them. Raisins are also a good source of iron and potassium, and a decent source of fiber. As with dried apricots and other dried fruits you’ll want to be careful with total amount of sugar taken in, as they can contain more sugar than your average fruit. Tips for eating more: Add them to oatmeal (oatmeal is also a good source of protein), or to oatmeal cookies. They’re also easy to take with you and use as a snack when you’re on the go. Prunes are known for their fiber content and their ability to help keep you regular, but they also rank pretty highly in the protein department, for a fruit. Having a few prunes each day is a good habit to get into, but like all dried fruits be sure to limit your consumption due to the high sugar content. In addition to their fiber and protein content, prunes are also a good source of phenols, which will help you avoid chronic disease and help keep your heart healthy. Their fiber content will help keep your blood glucose levels stable which helps you maintain a healthy weight, and avoid the onset of diabetes. That’s a small fruit with a lot of healthy benefits to it. 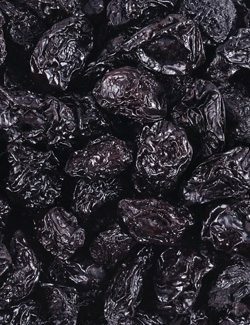 Go with whole prunes rather than prune juice, as there is more protein in it, and more potassium. Tips for eating more: Prunes are easy enough to eat more of because they can be eaten as a snack all by themselves. No matter if you go with fresh figs or dried figs you’ll be getting some protein from them, as well as other nutrients that contribute to a healthy diet. 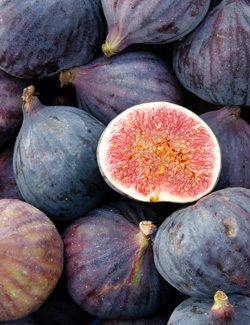 The main variation you’ll find with figs is whether they’re fresh or dried. Dried figs will provide more protein per gram, but they’re also much higher in sugar, which counterbalances the benefit you get from the protein. Figs also made our list of foods highest in calcium, and are also a good source of potassium. In dried ,form they are an excellent source of fiber, which will help you feel full and is a great complement to a high-protein diet. Tips for eating more: If you’re not used to working with figs it can require a little familiarization, but it’s worth the effort. Once you learn how to prepare them you can use fresh figs in a number of different ways, from an salad garnish to an appetizer, and more. These fruits deserve an honorable mention on our list, so we wanted to give them a quick shot out. Chances are you won’t eat too many dates in one sitting because they are very filling, but you can get your protein fill with these if you eat enough of them. Not too much compared to big protein foods like chicken, but when used along with other fruits and vegetables it can add up. You’re helping to boost your potassium numbers when you eat dates, which will help you avoid running a potassium deficiency which can lead to several health complications. When eating dates you’ll also be helping to achieve your fiber goals for the day, as they’re a good source that will help your cholesterol levels as well as stabilize your blood sugar levels. 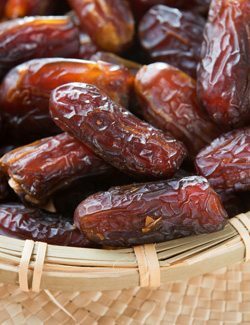 Tips for eating more: Dates are a portable snack that you can take with you and eat while on the go. They are often used in baking for their chewiness and natural sweetness. If you’ve never had a kumquat you definitely need to add it to your shopping list. Not only do they contain more protein than many other fruits, they are full of vitamins and phytonutrients that help the body in a number of ways. Kumquats can be used as part of an anti-inflammatory diet designed to reduce the symptoms of inflammation in the body. They’re also a good source of fiber, and can give you a boost of energy if you’re feeling run down thanks to their riboflavin content. 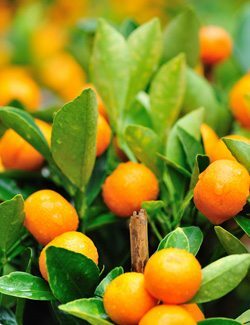 Kumquats aren’t just a decent source of protein, they’re also a great source of important vitamins, such as vitamin C, which will help your immune system. Tips for eating more: Eating a kumquat doesn’t have to be tricky. You can simply wash it off and pop in in your mouth. It’s entirely edible, or you can spit out the seeds if you prefer. My creatinine is increasing very high it is 7.14 at the moment. Please guide me on diet. I am 39yrs, diabetic & high pertention.Thanks. what is your diet right now??? 3.4, 3.1, 2.6, 2.4…. but what is the serving size??? How many dates do I have to eat to make it worth the diarrhea? The fruit that should be sitting at the top of this list is a coconut as it yields 13g of protein which is in fact the highest amount you can achieve naturally from fruits. due to the sugar content it is also a natural recovery drink after a good workout. Yogurt. Can yogurt make you grow taller? What are the serving sizes? Is this per cup? You still want food with protein!! It is SO essential to everybody’s health. It’s harder to get enough protein as a vegetarian, without getting too much carbs, so it’s worth doing the research. The top fruits listed here are very high in carbs so they’re not really that great of choice for protein. This list could be really helpful except that it’s forgetting something absolutely critical–serving size! And despite repeated requests for serving size, it hasn’t been updated. Shame. Nice list! Another fruit, although often harder to find, is the horned melon (kiwano). Per the USDA Food Database, it’s 1.78g/100g of fruit, after subtracting water, comes in at around 16% of protein on a per-calorie basis! I’m 17 but I have loss my weight……. How to maintain a diet pls help me…… And I need to reduce my tummy…. Because it’s growing little big….. I need to stop that pls help me to make a diet plan……pls reply me….